4 sheets - Each 2" x 4.25"
Be Koool gel sheets provide immediate cooling relief in a convenient disposable product. They need no refrigeration and are portable, ready to use anywhere and anytime your child has fever discomfort. Gently adheres to children's foreheads. 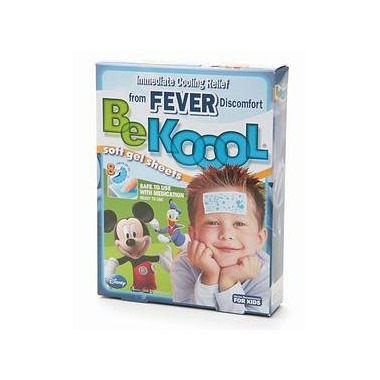 Be Koool gel sheets are sized to fit children's foreheads and offer just the right amount of cooling to maximize children's comfort. Cooling effects of each sheet lasts up to 8 hours. Since Be Koool® gels sheets are non-medicated, they are safe to use with medication. My 19 month old isnâ€™t a big fan. But my husband and I really love it as it keeps the babyâ€™s fever go down. Convenient especially at night when all of you guys are trying to get some rest too. My daughter loves this "big bandage" whenever she has a fever. It helps to keep her forehead cool and stay on throughout the night. Perfect to put into my diaper bag medicine kit! These work really well at bringing down a fever and stay on through sleeping. The best thing to help bring down my son's fever as well as mine (I also tried it). Thank God I purchased 3 boxes for my self so I have back up now for more fevers to come in the future (but I actually hope NO fever comes back...). Thanks Well.ca for caring items that are a hard find as well. excellent effect. maybe, I will buy it again. Great product! This product saved me, and would bring it down fast! Still use this product for my daughter, and I've used it for myself too. It allows you to be mobile and even just sit up while resting, rather than having a cloth on the forehead. Also great when sleeping, don't have to worry about a thing! This product has saved me many, many times. Last winter my daughter caught every virus, and consistently had high fevers. Before finding out about this product, I would spend hours with a cloth with water constantly cooling off her forehead. Her fever would not decrease, even with medication. This product saved me, and would bring it down fast! I didn't have to worry about her sleeping with in and falling off either. Thank goodness we have someone distributing it in Canada. I had to have people traveling to the US bring me back multiple packs at a time!